As far as classic slots go, there are none out there to have the same theme as this one. 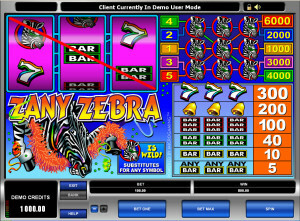 Zany Zebra is indeed themed around a zebra, which seems to be a bit on the nutty side. It wears green sunglasses and there is a party atmosphere all around, with rainbow colored outlines for the 7s and other colors chosen for the bar icons. I don’t even remember seeing a modern slot with this exact theme, so it’s probably a completely unique slot that Microgaming offers us here. While the theme is somewhat unusual, the layout is quite normal, using 3 reels & 5 bet lines. There is only a wild symbol in this game, nothing else, but you do get a chance to win $30,000. The Zebra symbol was selected to be the one that is used in the role of the wild, and of course it awards the top jackpot and it’s the only themed symbol that is used. If you want to get the slot’s biggest prizes, better pray to get three Zebra wilds on the same line, and not just any line. Each payline awards a different number of coins for this combo, with the higher lines paying better. 1,000 coins is the minimum you can get, while the fifth line awards the maximum, 6,000 coins. You also get something from this symbol when one or two appear on the same line, with the rest of the symbols meeting certain requirements. Two wilds need only one other symbol in place, to get a combo going. One wild on the line needs two matching regular icons, and the combo forms again. This being a classic with multiple lines, you can expect a wager to be composed out of as many coins as you want lines that are active. Up to 5 coins are used each round, with the value of each one being between $0.25 and $5. That means a top wager of $25. If you get the right combo of symbols and on the right payline, you can expect 6,000 coins, or $30,000. Another line will offer a smaller payout for the same combo, as small as $5,000. The Zebra theme is quite clear, as is the party atmosphere that the developers went for. There are all sorts of colorful borders used around the classic icons, with only one symbol being directly themed around the zebra. As for the reels, they are entirely pink, which is very unusual for Microgaming, a developer that always uses the white color in its classic slots. Symbols: Zebra (6,000 coins, wild), Rainbow 7 (300 coins), Red Three Bar (100 coins), Green Two Bar (40 coins) and Yellow One Bar (10 coins). The unique theme and the party atmosphere might be good enough for some players, while others will find that it has a dated look. It doesn’t stand out in any other way. 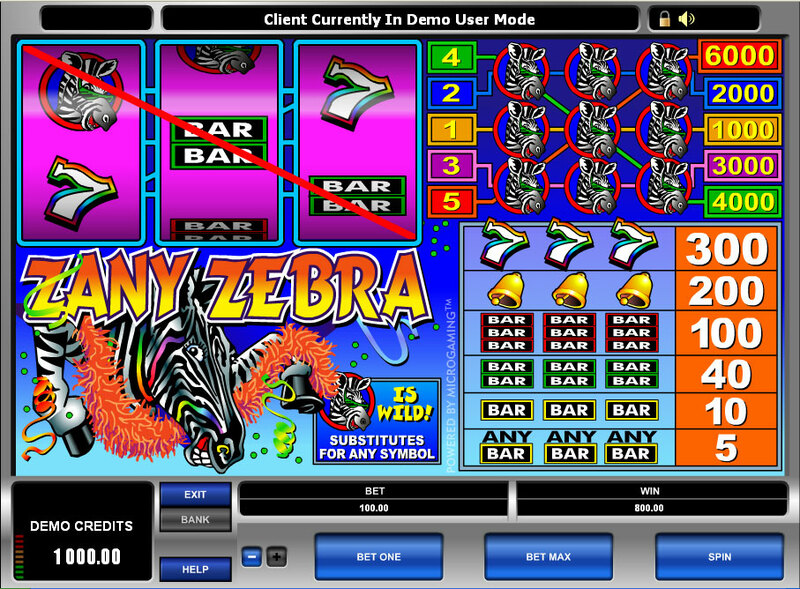 You will find Zany Zebra at any online casino which chooses to use software from Microgaming, playable either for free or for real money.